A decent mix of art-house cinema and neo-noir thrills. 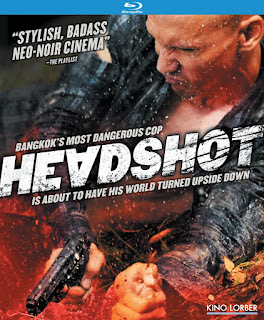 ‘’Headshot’’, the critically successful adaptation of the novel ‘’Rain Falling Up the Sky,’’ by acclaimed Thai author Win Lyovarin, is a gritty neo-noir that transcends its genre’s boundaries by raising important questions about morality, and using a handful of allegorical situations that almost work as a subtle sociopolitical statement. It is not a great film, but a very good one from Pen-Ek Ratanaruang, one of the greatest Asian directors working today. Tul, an ex-cop turned hit-man, gets shot in the head and wakes up from a coma three months later, only to realize he now sees everything upside down. What follows next is a fairly familiar noirish tale of betrayal and revenge that rings quite a few similar notes with classic film-noirs (e.g. the femme fatale presence), while showcasing a handful of westernized film influences. For instance, the protagonist faintly resembles the antihero from ‘’Taxi Driver’’, Travis Bickle, in the manner that they are both outcasts who begin to see the world in a different manner, with the main difference being that the first one changes because his misanthropic and nihilistic approach to society makes him go insane while the other’s ambiguous moral compass switches into a naive empathetic behaviour, when he starts seeing everything, literally, upside down. Tul is an extremely well-written character and Ratanaruang’s decision to depict institutional corruption and system incompetence through his hero’s experiences is quite powerful in all its simplicity, which helps the film rise above its narrative flaws. Pen- Ek Ratanaruang is famous for his adoration of combining different genres in his movies, with the most famous example being his masterful romantic dramedy ‘’Last Life in the Universe’’, but ‘’Headshot’’ is a straightforward noir and a particularly good one at that. His gloomy stylistic choices, the amazingly directed action pieces, the breathtakingly beautiful shots and his strange approach to the genre make for a rewarding and unique cinematic experience that only a creator of Ratanaruang’s caliber could create. But the movie isn’t without its problems, with the most off-putting being the fact that one of its main goals is to criticize the current state of Thailand; so many audience members unfamiliar with these situations might lose vital points the movie is making and mistaken its deliberate simplicity for shallowness. It manages to create a tight connection between Tul and his hometown using brilliant and subtle techniques (there is a scene, for example, that shows him sitting on his balcony from a distance and it appears like he is ‘’drowning’’ in a sea of hundreds of apartments) that may, sadly, go unnoticed. As it is almost always the case with all of the director’s pictures, ‘’Headshot’’ features great performances all-around but Nopachai Chaiyanam’s portrayal of Tul, in all its underperformed brilliance, is a tour de force from beginning to end. He approaches the problematic anti-hero with an interesting emotional depth that is nothing less than impressive. The movie’s technical aspects are first rate from Chankit Chamnivikaipong’s award winning dark and atmospheric cinematography to the expertly tight editing from Patamanadda Yukol, but Vichaya Vatanasapt’s hypnotic score stands out as the most impressive one. ‘’Headshot’’ is an impressive art-house noir that will most certainly entertain Pen-Ek Ratanaruang’s fans and crime drama aficionados, even if it doesn’t entirely succeed in producing a noteworthy combination of genre thrills with sociopolitical critique.